Retail trends accelerated in March, with 50 percent of dealers reporting growth versus 28 percent who said they had declines in sales, according to a new survey. 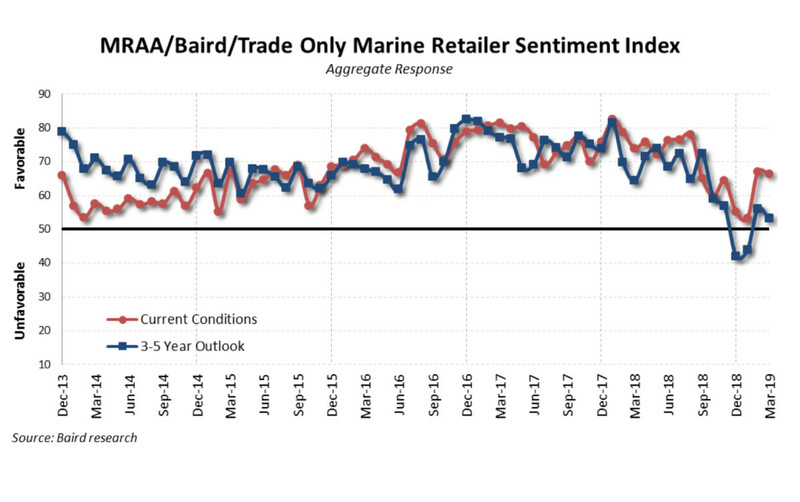 "The overall sales climate appears to be improving compared to the past six months,” wrote one dealer responding to the survey conducted by Baird Research in conjunction with the Marine Retailers Association of the Americas and Trade Only Today. Another dealer mentioned that boat shows have been working, but "results seem to come 30 to 90 days later,” wrote Baird in the monthly Pulse Report. Still, dealers are growing more cautious about a potential slowdown, prompting dealer sentiment about current conditions to tick down from 67 to 66, and the 3- to 5-year outlook dropped to 53 from 56 in February. Several dealers commented on steep price increases as being deterrents to new boat sales. Weather, workforce shortages, and lackluster or absent manufacturer promotions also made the list of dealer complaints. Negative media reports about the economy also made the list of things that weren’t working for dealers, as well as print advertising. Some said manufacturers had caught up with demand, while others commented that they were still having trouble getting product on time and said quality was lacking when they did get boats. “New boat inventory comfort continues to improve, but gradually,” wrote senior Baird research analyst Craig Kennison in the results. More dealers still report inventory is too high — 41 percent — than the 11 percent that felt it was too low. Used inventory remains relatively lean, as 52 percent reported it was too low versus 22 percent that thought it was too high, but added that used inventory may be coming back into the market. "Value buyers and non-new boat buyers are making a comeback since there are again many used boats available,” said one dealer. Read more about the survey results in the May issue of Soundings Trade Only.